A Red River College instructor is flying high after being honoured for his efforts by Apprenticeship Manitoba. 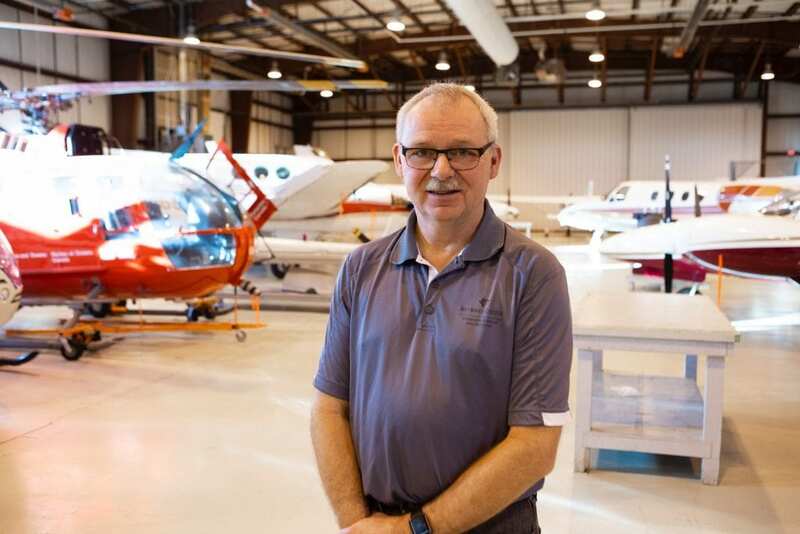 Gary van der Zweep is the academic coordinator of the Apprentice Aircraft Maintenance Journeyperson (AMJ) program at RRC’s Stevenson Campus in Southport, just south of Portage la Prairie. Earlier this month, he was named Instructor of the Year at Apprenticeship Manitoba’s Awards of Distinction gala, held at RBC Convention Centre Winnipeg. “It’s nice to get kudos here and there,” says van der Zweep. “I’ve been told by other teachers that you take it when you can get it, because it doesn’t come around all that much. The AMJ program provides students who are already employed in the aviation and aerospace industries with the training they need to acquire their Transport Canada aircraft maintenance engineer (AME) license. It’s the only Transport Canada-approved AME apprenticeship program in Canada. Though van der Zweep has taught at Stevenson for almost 18 years, his time there actually predates RRC’s involvement with the training centre. In 2002, Stevenson Aviation merged with RRC to form the Stevenson Campus. “I’m working with some of the students that I taught,” van der Zweep says. “It just shows how old I am. I’ve been around so long they’re already teachers themselves. Having grown up on a dairy farm in Balmoral, Man., van der Zweep attended high school in nearby Selkirk, where he took automotive mechanics courses. In the 1980s, he was working as a truck driver when a girlfriend’s father suggested his current career. “He was an aircraft maintenance engineer and a pilot and said, ‘This might be something you’re interested in,’” van der Zweep recalls. “I had to push my tool box about three hangars over,” he says with a laugh. Though he admits he kind of fell into it, van der Zweep wouldn’t change a thing about his career path.